As snowdrops push their way to the earth's surface and open into sweet white bloom, so vague dreams of this year’s garden develop into the excitement of planning beds and choosing seeds. 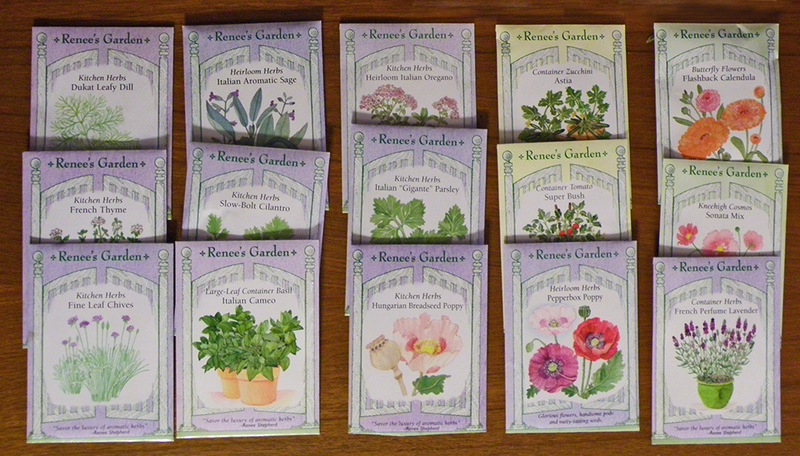 I must credit Renee Shepherd from Renee’s Garden for getting me started early this year by sending me some seed samples last month. I met Renee quite a few years back as my teaching assistant in an Environmental Studies class at University of California. According to my sources (a former employee), she is still as sweet and as dedicated a worker as I remember her, donating seeds for charitable projects around the world. Throughout the years I’ve grown plenty of her heirloom flowers from seed, and am excited to be branching out into herbs and veggies. My advice to new gardeners is to start small. It’s easy to purchase too many things, then become overwhelmed with their planting and upkeep. Two good rules are to plan where each plant will go first and not buy more at any one time than you can plant in a weekend. Pick low-water flowers like California poppy varieties, or veggies that you like that taste significantly better when home grown. For example, tomatoes off the vine taste better than just about anything you can buy. Basil can be used throughout the season with the tomatoes as well as frozen for winter, and is easy to grow, so is another good choice. Snails and slugs love it too, but you can literally foil them by growing basil in pots that are wrapped with a strip of self-adhesive copper foil. Lettuce and other greens are also best fresh from the garden, and it’s easy to grow most, including container-friendly varieties. My second bit of advice for new gardeners is to read the fine print, and buy plants that are adapted to the place you want to put them, or conversely choose plants appropriate to your space. Check the plant’s size and preferred amount of sunlight and water, best time of year to plant, etc. Find plants that work with your planting beds, and the amount of time you have to garden. Ask gardeners in your neighborhood for advice. Some plants, like squash, are easy to grow if you have the room, but also produce what can be an overwhelming amount of veggies if not tended to daily. Flowers can be easy to grow and add brightness to your yard if their size, water, and light requirements match your yard's environment. New gardeners can also consider container gardening. The media tells me this is a new trend, but I practiced this for years while renting from unpredictable landlords. Since this is just the second year in my new home, I’m still doing this before designing the permanent beds. The pots are portable (do use a hand-truck), so if a plant needs a bit more or less sun, just move it. You can also move the pots around between summer and fall to take best advantage of the light. Note that container gardens require daily work during hot summers, which is not always the case with beds. Renee has some more tips here. Renee’s container-friendly seed list includes carrots, celery, eggplant, radishes, and peppers, plus the usual greens and herbs. You’ll also see not-traditionally container-friendly flowers like sunflowers, cosmos, dahlias and larkspurs. I’m going to plant “Super Bush” tomatoes and “Container Zucchini.” Anyone who has tried growing zucchini in a container can testify that, contrary to popular belief, zucchini will not grow everywhere. My “pot” garden will be mostly herbs this year: chives, French thyme, Italian basil, oregano, sage and parsley, slow-bolt cilantro, Dukat dill, plus a French perfume lavender. (My marjoram survived the winter.) For bedding plants I’m adding kneehigh cosmos and flashback calendulas (white backs “flash” in the breeze) to a bed where other calendulas bloom profusely. 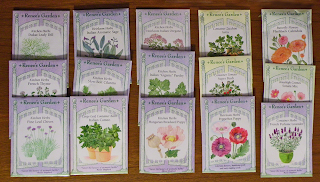 Then, I broke my first rule of gardening and purchased two seeds that I have no idea where to put (see how easy that is?). But what gardener cook could resist Pepperbox and Hungarian Breadseed poppies, which in addition to looking lovely can be dried for culinary poppyseeds? Feel free to post any seed sources and beginning gardening information that you might have. I'm also interested in composting information. I'm a square-foot gardener. It satisfies my need for order, and is a great way to use a small garden patch--no rows between plants makes for a higher yield per square foot (or meter). I have just six square feet but each square foot can hold more than you'd imagine. You can also grow up if you're planting vines like squash. Here's a roadplan for the density you can achieve that I found on the web. Amazing plan, Rob. Especially useful for urban gardening, which is becoming more popular. Do you use raised beds or till the soil directly?